I’ve been watching the multi-car motorway pileup that is the Labour party at war with itself – on social media and elsewhere – for the last few weeks with a sense of bemusement. I’m surely not alone. It seems to be an object lesson is miscommunication and wilful misunderstanding. Many of the protagonists, particularly on the left, seem dead set on reacting vehemently to even the slightest criticism and with venom to critique that is, when viewed with a bit of perspective, entirely fair comment. Any attempt at nuance is redundant: it’s a Manichean world, in which we’re unambiguously a force for good and everyone else – most particularly the “Blairites/Red Tories” – is evil incarnate. I guess if you view any non-conforming statement as representing an existential threat to your vision of the Party then the atmosphere is going to get a bit febrile. It would appear there are only two choices available: unquestioning public loyalty to the current Leadership or fully paid-up membership of the conspiracy to strangle a leftwing social movement at birth. The capacity for a cool appraisal of the situation and strategy consequently becomes significantly impaired. I wouldn’t particularly have written about this situation, except that I was very struck by Owen Jones’s Medium post Questions all Jeremy Corbyn supporters need to answer and the response it has elicited. Jones attempted to construct for himself a sympathetic ethos – he’s fully on board with the sort of left project that Jeremy Corbyn represents. He then sets out nine questions that he believes the Labour leadership needs to answer, and for which he feels he has yet to hear plausible answers from the current leadership. These questions include: how can the “disastrous” opinion poll figures be turned around?, where is the vision?, what’s the media strategy?, and how can the membership be more effectively mobilised? These questions are entirely reasonable. They are the sort of things to which the leadership of the Labour party will need answers if it has any aspirations to hold Parliamentary power any time soon. There are no doubt other, similar questions Jones could have asked that would have been equally pertinent. As things stand, all the evidence suggests that Labour — and the left as a whole — is on the cusp of a total disaster. Many of you won’t thank me now. But what will you say when you see the exit poll at the next general election and Labour is set to be wiped out as a political force? What will you say when — whenever you mention anything vaguely left-wing, you’re mocked for the rest of your life, a throwback to the discredited Labour era of the 2010s? Will you just comfort yourself by blaming it on the mainstream media and the PLP? Will that get you through a lifetime of Tory rule? My questions may strike you as unhelpful or uncomfortable. I’m beyond caring. Call me a Blairite, Tory, Establishment stooge, careerist, sellout, whatever makes you feel better. The situation is extremely grave and unless satisfactory answers are offered, we are nothing but the accomplices of the very people we oppose. Jones’s post has elicited responses from several bloggers who have offered answers to his questions. Some have done so in a way that plays things reasonably straight. Others have done so in a way that manages to insinuate that Jones’s post is as much about pushing Brand Jones as any genuine concern for the leftwing project. Jones’s attempt to establish his position as sympathetic to the project is dismissed as self-aggrandising. Indeed, some would appear to suggest that Jones has never genuinely been leftwing all along. The response on social media has been nothing if not splenetic. Just about everything and anything about Jones’s post has been criticised. The timing is wrong – why not do it after a leadership election? – the content is wrong – it fails to recognize that the deterioration in the Labour party’s poll ratings has more to do with the failed leadership coup attempt than any failing on the part of Jeremy Corbyn. The party’s performance in elections is nowhere near as bad as its opinion poll ratings. Jones neglects the fact that Corbyn can get a substantial crowd of supporters to turn out on a wet Wednesday in Wolverhampton. Labour’s problems in Scotland are a problem of Blairite neoliberalism not Corbynite ineffectiveness. Why is Jones expecting the party leadership to have answers to these questions when he isn’t demanding that Owen Smith also has answers? Surely this shows he’s betrayed the leftwing cause to become a Red Tory. And so on and so forth. Jones has been moved to respond to some of this commentary on Facebook, as well as on Twitter. His original Medium post exudes exasperation – I have no trouble believing his claim that he is only raising these issues publicly because raising them in private has not resulted in any illumination. He is right to say that there is a significant risk of a snap election so postponing thinking about these issues is unwise. Given that Jeremy Corbyn is very likely to win the leadership contest again it seems more pertinent to ask whether he’s got answers to these questions than Owen Smith. Getting ten thousand people to turn up to a rally every so often and securing several million more votes, either from those who are not currently politically engaged or are swing voters, are two completely different propositions. And so on and so forth. It would be perfectly possible for Jones to have engaged rather more firmly with some of the criticisms. For example, the issue isn’t why Labour lost Scotland. It could be entirely the fault of Blairite neoliberalism. The question is how is Scotland to be won back. Even if we think Corbyn has the policy platform to do it – and as yet it is rather hard to tell – there has to be something rather more concrete to the strategy than that. Through what specific actions are the low-information not particularly politically engaged voters going to be encouraged to switch back to Labour? We could add that this debate has been hampered – as all political debate now is – by the tendency for arguments to be based upon statistics selected to most flatter the favoured case. A good example would be Labour’s electoral performance under Corbyn. If you want to be supportive, select positive byelection results. If you want to be critical, select shockingly bad local election results. “Call me a Blairite, Tory establishment stooge careerist, sell-out whatever makes you feel better,” Owen concludes. I will do none of these things. I will not go further than saying I would not like to be in a trench alongside Owen under heavy shelling. The events of the last month, which he mainly ignores, have represented an unprecedented attack on an elected Leader of the Party. They are part of a move to break the power and influence of the Left that Owen claims to represent. It is a moment for solidarity, not back-stabbing. Owen’s concerns, many of them quite legitimate, could have been expressed privately. Raising them in the way he has, certain to give comfort to the Left’s opponents, speaks for itself. The rhetorical tropes here are effective, if unedifying. The implication of cowardice and betrayal here must be infuriating for Owen Jones. It also strikes me as entirely unfair. If there was one high profile commentator making the case for the leftwing project during the wilderness years when it was seemingly irredeemably out of fashion it was Owen Jones. Long before Paul Mason shrugged off the shackles of objectivity required by the mainstream media and started frothing about neoliberalism, Jones was making the case pretty much all by himself. Indeed, three years ago I wrote a blogpost about him – which now reads a bit like a museum piece – in which my point was precisely that he was keeping the flame alive in the media like no one else. The idea that he isn’t used to “heavy shelling” seems risible. The difference is that he’s been subject to it from the Right for years, and now he’s getting it from the Left as well. From the outside, this whole situation now has the “heads I win, tails you lose” feel about it. The sort of thing that is not unknown in more authoritarian regimes. It doesn’t matter what you say sooner or later you are going to be condemned by your own words. And then you’re drummed out the Brownies. Conformity must be maintained. It is perfectly possible that one could agree with Corbyn’s broad policy position and yet still think he isn’t the leader to deliver power to the Labour party. That could be a matter of competence. It wouldn’t necessarily be a criticism to say that he’s never in his life had to lead a large and complex organisation so there should be no surprise that he is unable to now. It could be a matter of history and legacy. 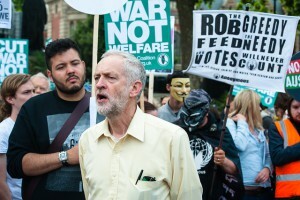 Corbyn has aligned himself with so many problematic causes and policy positions over the years that any serious political opponent could render him a figure of fun – or public enemy number one – without any great difficulty. There is nothing incoherent in the idea that a more competent leader with less baggage, adopting exactly the same policy perspective, would put the party in a better position. Anyone tempted to argue that Corbyn doesn’t have a chance because of the machinations of the Red Tories in the PLP and/or the MSM and/or the Establishment and/or Global Capital – and that Corbyn’s leadership credentials are unimpeachable – is pretty much saying the leftwing project is kaput. Even with a leadership genius in post, the party cannot overcome its opponents. On the other hand, if there are organisational and leadership issues then there is hope. A stronger leader would be able to build bridges and bring the party with them. They would be able to better negotiate and neutralise the threat posed by broader structural biases. They would be better able to articulate effectively why the leftwing project is not simply the product of envy and discontent among the excluded, but could result in a society that is better for all. The Owen Jones episode is an illustration that even those who are very much onboard with this programme see the current approach as flawed. And for that thought-crime they must be denounced. That’s a pretty disastrous tangle to get yourself into. I fear that given the leadership election timetable (September I think?) the toxicity level will only rise and a Corbyn win looks like it leads to a party split. With respect Alex, for once you may have entirely missed the point. This is all a London bubble farrago complete with the metro-London Court performers like Owen Jones. Like the Westminster political caste in general, it all resonates very little with the rest of the UK population. We had a foretaste in Scotland with the grievous, dire, self-inflicted demise of Labour – mostly to do with the dead hand of London-centric control (see e.g. Gordon Brown). Incidentally, Owen Jones’ occasional forays online into the Scottish referendum campaign served only to underline this reality of the alienation of the Westminster and metro London bubble from the rest of the UK. As an outsider, my comment on Labour’s electoral performance in May 2016 is that it wasn’t much affected by Corbyn. People who had previously reluctantly voted Labour now did so enthusiastically; people who had previously enthusiastically voted Labour now did so reluctantly. But, overwhelmingly, they still voted Labour. Very few people who didn’t vote Labour previously now did. Corbyn isn’t turning out former non-voters, but I’m far from convinced that the alternatives were likely to turn out former Tories or former Lib Dems either.